Big juicy looking ones, bright yellow oozing ones, and those with a funky pattern. 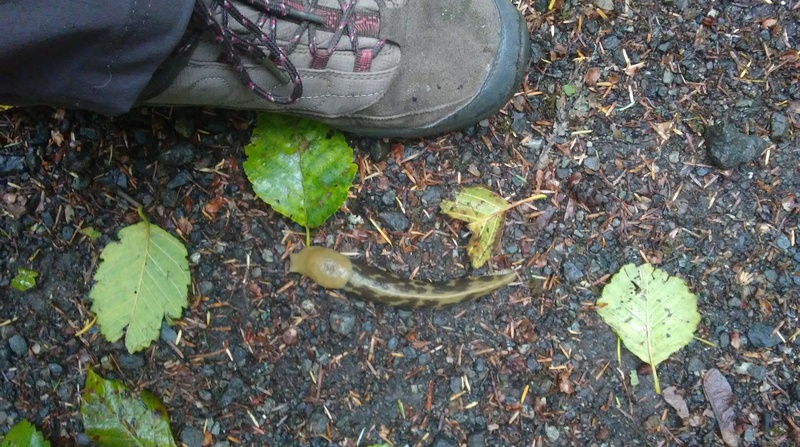 As a hiker, you see all kinds of slugs on the trails around Washington or just in your garden. But over winter there is no trace of them, not even a slime trail. Where do all the slugs go? How do slugs survive the winter frosts? Because the slimy suckers are certainly present again now that it’s spring. The first tactic that slugs use to survive the winter is to hide. It’s estimated that only 5% of the slug population is seen above ground at any one time, but in winter, the slime-balls head deeper underground to take refuge from the frost forming at the surface. Once settled, the slugs shut down and go into hibernation. Hence, the absence of slugs on Washington trails in the winter. Imported species from more temperate conditions, like the banana slug, don’t have these freeze-tolerant abilities. These slug species are able to persist and thrive in our northern climate because their eggs endure the winter to hatch in the spring, even if the adults never reemerge. And, thus, the new generation arrives just in time to attack your fresh dahlia blooms. On the other hand, hardy northern breeds have adapted over thousands of years to survive harsh winters by undergoing drastic changes in their basic bodily processes. One crucial change is an increase in tissue glucose, which makes slugs sugary – like popsicles! Storey goes on to explain this phenomenon: “Glucose binds to water molecules, protecting them from freezing. The free, unbound water molecules in a slug still freeze, turning the slug solid, but less ice is present in a sugary animal giving it a better chance of surviving.” And glucose isn’t just slugs’ own brand of anti-freeze; lots of animals use the same tactic to survive the cold, for example, wood frogs. So, there we have it. Slugs lurk hidden, frozen underground in winter. For some species, this can be self-burial, but for some slick survivors, now that it’s spring, they just need a moment to defrost. NB For slugs to freeze and survive, the process has to be gradual. If you stick a slug in your freezer (which some forum contributors have gone and done) the slug dies, leaving you with an unsavory ice cube. This article was written by Louisa Cockbill, a writer for dusk magazine and contributor at Science FYI.